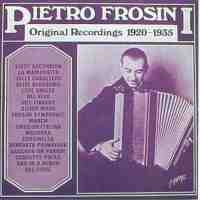 The Classical Free-Reed, Inc. CD Review of Pietro Frosini CD by Five Valley Accordion Assoc. Pietro Frosini (along with Guido Deiro, Pietro Deiro and Anthony Galla-Rini) was one of the early American vaudeville accordion pioneers. He was born in Sicily in 1885 and studied piano, cornet, harmony, counterpoint and composition at the Municipal Conservatory of Fine Arts in Catani Sicily as well as the Milan Conservatory of Music. He emigrated to the United States in 1905, made his accordion debut at Fresno California, and became a vaudeville star (billed as "The Wizard of the Accordion") who in 1911 gave a command performance before King George V of England. Frosini wrote approximately 200 original pieces for accordion; most were light and entertaining but some were more serious, like his virtuosic Variations on Carnival of Venice (1938) and Three Rhapsodies (1939). He passed away in New York City in 1951. This CD is a re-release of a compilation of original Frosini 78 RPM recordings (1920-1935) which were again released on 33 RPM LP format disc in Finland in 1985 on the Polydor label. Frosini's playing is a pleasure to hear: technically facile, musically sensitive, and at times, theatrically dramatic. In addition, several tracks feature the "bellows shake," an accordionistic technique which he is reputed to have perfected, if not invented. He is accompanied by an unamed banjo player during many tracks, and an anonymous piano player for at least one track. "Years ago John Molinari called me to ask if I would lend him some Frosini records as he wanted to make a [33 RPM LP] record of them. My wife and I went to his home in Oakland [California]. He played for us and we met his wife Deva. Then he and I went to a recording studio in Oakland. They put my records on a reel-to-reel tape, which he took to Finland as he was leaving to do a concert with Veikko Ahvenainen, who played the button (chromatic) accordion. "Veikko had a friend in the recording business who was a master. He took these old records, pressed in 1920 and 1935, made a 12 inch 33 RMP record, took all the scratches and noise and cracks and surface noise off each record, making it sound like an LP. Unfortunately, I am not so enthusiastic about this CD. I haven't heard anyone else's copy, but the CD I received in the mail was full of so many scratch noises, pops, and hisses that I thought it must be defective. The scratches continued even between the tracks. Particularly disturbing to me was the awful distortion during loud passages. I suspect this may have been caused by using a lightweight needle which jumped violently in the grooves during the loud sections. I'm sure this could have been reduced by using heavier needle pressure. To tell the truth, I would rather listen to a cassette of original Frosini recordings given to me by another accordion record collector which seemed to have been more carefully recorded and is much more pleasant to listen to. To make a really fine CD, one would have to go back to the original 78s, put them through a computer-generated scratch removal program, and put the result directly to CD disc. The music on this disc was first transferred from the original 78 discs to a 33 RPM disc nearly 20 years ago. Then that disc (which after almost two decades probably acquired a few new scratches of its own) was put onto CD. This is like making a photocopy of a photocopy. Everyone knows that the first generation copy produces the most detailed result. Although I am pleased that the Five Valley Accordion Association has made these historic Frosini recordings available on CD, I am sorry that it was a low-budget production. The one-page CD booklet notes are minimal. I would have loved to read something about the original recordings: what label they were released on, what was on the B side, etc. I was curious that one track from the original LP release, Coquette Polka, was not included in the CD. Was the song on the LP too badly scratched to include it? I really wish that the studio engineer had access to Eddie Chavez's original 78 recordings. At least this CD is a start. I applaud the efforts (if not the final product) of the Five Valley Accordion Association to make an important piece of American accordion history -- fifteen Frosini original recordings -- available to the general public. * Eddie Chavez, The BAAC Page: Bay Area Accordion Club Newsletter, January 2002, p. 3. As always, readers who have listened to this CD are invited to submit their own opinions for publication on this page.